I’m afraid there’s somewhat of an emphasis on the “short” element of this film today but it’s a project that resonated with me somewhat earlier so I felt it was worthwhile showcasing despite the fact. I’d like it to be a little longer and I’m sure after watching you will too, but it is what it is, and even though this is concise it’s still an insightful project that the Tumblr team have put together. 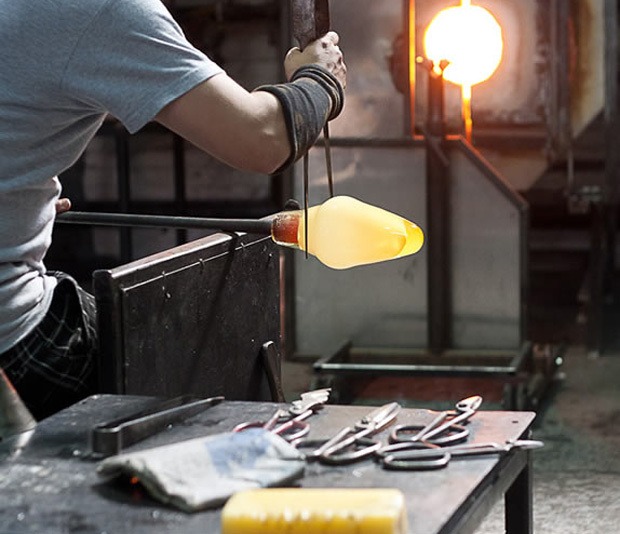 Here we discover the workshop of Brooklyn Glass as a means of an introduction to the craft in general, via the narration of co-founder Alan Iwamura. The videos purpose is to inspire others to pick up the craft and appreciate the skill it takes to create glass outside of a mould, something we are passionate about here too. I’m always fascinated by this type of work when I come across it, I don’t think I’ll ever grow tired of the enigma it presents, one moment the material is fluid and flexible and the next it is set completely, it’s such a frantic and difficult process. I can’t speak for anyone else but when I see individuals who have started to master this medium I’ve got nothing but absolute admiration for their dedication and resolve. Like Alan mentions in the film below it takes an obscene amount of practice, which at times can be overwhelmingly frustrating. If you make it out the other side however, like lots of these individuals in the film below, you can create something truly remarkable and absolutely one of a kind. If you are lucky enough to live locally to the studio I’d really urge you to go get involved with the workshop who do a massive amount for new individuals wanting to take up the craft. If like me you don’t like in Brooklyn however, or America for that matter, I’m sure if you look hard enough you will be able to find somewhere to have a go yourself. Even if you aren’t planning to make this a career I think as creative people it’s always important to take on new experiences to inform how you approach your work, you never know it might give you a new perspective. Watch below and see what you think.